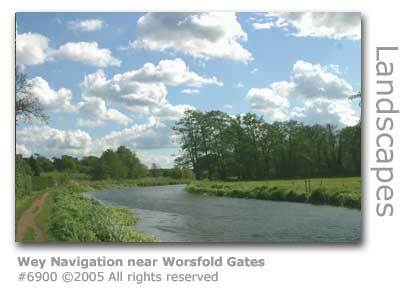 This site will provide you with a great introduction to the River Wey, the Wey Navigations and the beauty of the valley all around. You'll also be introduced to its rich history and the diversity of its industry and inventiveness of its people. This site has been designed to provide a detailed resource of information to help you research more about the valley. If you're purely interested in finding out about things to do for leisure we've compiled a section to give you a starting point. Just CLICK HERE. Otherwise scroll down and read on. Here we introduce you to the Wey and its diverse and fragile wildlife habitats. An inaugural nationwide Quality of Life survey conducted by the Halifax (2008) rated the Waverley Borough in second place behind Chiltern. The survey, which purports to measure what rates as the best of the countryside, uses data from rural authorities to provide key indicators for its rankings. Indicators measuring employment, earnings, housing quality, carbon emissions, crime, weather, health and educational performance are used. Waverley has high average weekly earnings of £728 (Chiltern £866) reflected by an above average spend of £161,667 for property - the cost of desirability. The two navigations have 16 locks, 12 weirs, 50 weir structures, 24 bridges, 13 cottages and 24 other buildings, together with a fleet of 11 maintenance craft to operate. There is another River Wey. The Wey, from which Weymouth in Dorset gets its name, is a much smaller river that springs from the South Dorset Downs and has much of its course confined to the suburbs of the town. Nevertheless the river is an important wildlife habitat and Radipole Lake fed by the river is a National Nature Reserve. In common with much of southern England the Wey Valley had to deal with drought conditions in the spring of 2012 after a particularly dry winter. The River Wey was reported to be at a level 30% lower than it should have been in early April. However, no sooner than the water companies had declared a drought and imposed hosepipe bans the region was hit with back-to-back weeks of heavy extended showers. Although members of the public found much merriment in the apparent irony of the whole situation, this wasn't shared by officialdom who pointed out that the water shortages were heavily entrenched. Most of the course of the Wey flows through the county of Surrey. Much of Surrey is in the Green Belt (a town planning concept for controlling metropolitan growth introduced nationwide in the 1950s) and its geology is dominated by the chalk hills of the North Downs. It is the most wooded county in Great Britain with a coverage of 22.4% compared to a national average of 11.8%. Administratively Surrey is unique in that the county's council HQ is not in Surrey but in Greater London at Kingston-upon-Thames, and has been so since 1965. Surrey is the most densely populated shire in England. The traditional nickname for people from the county is 'Surrey Capon'. This originated in the Middle Ages when the county was where chickens were fattened up for the London meat markets. Where speed is measured in Hours per Mile. Expanding Twickenham Rowing Club’s known world, we took a double (racing boat) up to Guildford and back this weekend.The route took in the Thames to Shepperton and the Wey River Navigations to Guildford. Allowing for a few wrong turns and an ice cream stop, that’s 52 miles in 18 hours over two the days. As much of the country suffered high winds and torrential rain in the first week of January 2008 the Wey Valley was subject to flood watch warnings. Thankfully the river was kinder to its inhabitants than those living in Oxfordshire and Yorkshire where local rivers burst their banks and caused severe flooding. "We arrived at the fork, River Wey to the left and Shepperton lock straight on, so we turned onto the River Wey to be met with a very angry weir coming from the Thames. Keith’s words were “This should be fun” and it was. "Keith revered Hadar’s engine into life and she ploughed through the turbulent water, sliding as she went but making it seem pretty easy. Oh deep joy at having a powerful engine. We arrived at the first lock on the River Wey and met the lock keeper Dave. Keith did the necessary paperwork and we were on our way. We only did one further lock before mooring up outside The Pelican Pub, where we had a nice evening meal, before settling in for the night. It had been a long day but a very enjoyable one. "8.50am we set off from the pub on a dull but dry morning. It looked like we would be in for a nice day weather wise. So we would be doing the River Wey Navigation to Guildford and it was certainly beautiful. At the first lock we were greeted by a fantastic mill, which is now apartments in a beautiful position. The only drawback is the sewage treatment yard next door. "The lock gates are easy enough; it is just the winding of the paddles which is hard work. When we signed Hadar in with the National Trust who owns the navigation, they gave us a long handled windlass to operate the paddles. The problem I have is I only have short arms and you have to operate some of the locks leaning over the canal, so it can be a little precarious. Another thing you are told by the lock keeper when you set out, is you do not need to shut the gates. You are supposed to tie up in the locks and turn your engine off. When opening the paddles you have to do it really slowly because the force of the water is incredible.
" We passed the Basingstoke Canal junction as we carried on with our journey; there were a few other boats on the move in the opposite direction. But sadly there was only one lock in our favour through the day. We noticed that the banks are full of bamboo, what they are missing are the panda’s LOL. There is also a lot of rhododendron, which are now out in bloom. A bit of colour in a lot of green. "The Wey is beautiful and gives some stunning views along the way, it also gives you some very tight turns as well, one of which has an under current making it very difficult to enter the lock. Keith did struggle with that, but managed to manoeuvre Hadar into the lock chamber. We finally moored up at the Dapdune Wharf at 3.50pm and were immediately into conversations with visitors to the Wharf, one family coming from Hamburg. Keith checked in with the Wharf Warden to make sure it was ok to stay, which it was and we sorted ourselves out with dinner. I spent the evening cleaning the boats brass and now I am sitting here typing this before bedtime. Wildlife we saw today: Herons. “I know it sounds silly, but when I went on the Wey Navigation over the New Year, I was really pleased to get the National Trust 'welcome pack' at its entrance, Thames Lock. I'm easily pleased. It didn't consist of much more than the free loan of a long-throw windlass, a folder containing assorted National Trust documents – including a good map of the navigation – and a round orange Wey licence. But the important point was, it felt like an official welcome. “At £27 for three days, a Wey licence is a steep price - in fact I was only on the river for less than two, so that was about £15 a day. However, openness and availability mean a lot to me, and I hate it when officials hide behind bureaucracy and anonymity. The Wey Navigation staff certainly don't do that. Indeed, the first sheet into the welcome pack was a list of phone numbers – mobile phone numbers! – for the various Wey 'lengthsmen'. The River Wey is quite unusual in that it has two sources, one in West Sussex and one in Hampshire. The two individual streams develop very quickly into fully fledged rivers both called the Wey but identified individually as the North Branch, flowing from Alton in Hampshire, and the South Branch running from Blackdown just over the West Sussex border near Haslemere. The two rivers flow into Surrey joining at the picturesque village of Tilford and remain in the county until reaching the Thames at Weybridge. The River Wey is also quite unique in that it has two man-made navigations the longest having been constructed around the time of the English Civil War 350 years ago. The canals by providing almost 20 miles (32 kilometres) of navigable water connecting the county with London, ensured that Surrey became one of the wealthiest and most influential areas in Britain. Later navigations connected to the Wey Navigations including the Basingstoke Canal and the Wey & Arun Junction Canal extended the reach of barges to waterways stretching the breadth and length of England, and also once provided a southerly route to the sea. The maintenance responsibility for the Wey Navigation and Godalming Navigation is considerable and was one of the reasons why Harry Stevens, of the Wey’s influential barge building and river transportation family, donated the Wey Navigation to the care of the National Trust in 1964. The Godalming Trust Commissioners followed suit four years later with their waterway being transferred to the National Trust via the Guildford Corporation. The two navigations have 16 locks, 12 weirs, 50 weir structures, 24 bridges, 13 cottages and 24 other buildings, together with a fleet of 11 maintenance craft to operate. A considerable responsibility, and when taken in the context of providing the manpower and finance to maintain all aspects of the waterways to ensure all-year-round navigation, it is one that represents a huge financial and legal liability. The 40 miles (64 kilometres) of river boundary running through the properties of over 2,000 land owners and across four municipal boroughs requires much attention, especially in ensuring flood control measures are in place and pollution avoidance. In the forty years since accepting responsibility the National Trust have succeeded not just in maintaining and improving the waterways preserving them for the nation’s enjoyment, but have also provided a commercial environment ensuring that they are financially self-sufficient. The Trust has a small full-time and part-time staff supplemented by a band of regular volunteers that provide for the needs of the navigations from administration through to maintenance. The volunteers include the professions of surveyors, solicitors, valuers and wardens. In September 1989 the National Trust celebrated 25 years of ownership of the navigations and marked the milestone by sponsoring the only remaining horse-drawn narrowboat to travel the full length of the navigations from Godalming to Weybridge. The narrowboat (NB) Iona is still operated by the Godalming Packet Boat Company and continues to provide horse-drawn trips for the public along a beautiful stretch of the river. A legacy of the two navigations are the towpaths that were built for the horses, carters, and bow-haulers that used to work the river. Unlike the rest of the river the full 19 ½ length of the canals are easily and freely accessible. They are however subject to the National Trust’s by-laws which restrict access to pedestrians and cyclists. With the exception of a short stretch near Byfleet between Murray’s Bridge (GR:TQ 058603) and Dodd’s Bridge (GR:TQ052601) which is a bridleway, no horses are allowed access. That is unless you have an operators licence to haul boats along the waterway. The Wey Navigations are used by all manner of pleasure boats including canoes, skiffs, skulls, rowing boats and narrowboats. There are a number of clubs along the Navigations promoting the use of the water for sport and pleasure. Two commercial boathouses provide all manner of boats for hire short and long-term, and many other water craft visit from all around Britain using the 2,000 miles (3,200 kms) of interlinked navigable waterways. Boats using the Wey Navigations are restricted in size by the dredged depth of water, dimensions of locks and bridge clearance providing for a maximum length of 73 ft 6 in (22.4 m), a beam of 13ft 10 in (4.2 m), a height of 7 ft (2.13 m) and draught of 3 ft (0.91 m). All boats regardless of size using the two navigations require a licence from the National Trust and the fees from issuing these provide important income to the Trust for maintaining the waterway. The Navigations and the two branches of the River Wey proper have registered angling clubs controlling fishing rights along those parts of the river with public access. Much of the River Wey upstream of the Godalming Navigation runs through private property, and where no public right of way exists visitors require permission to access the river from the landowners. Although the course of the rivers and navigations drop a mere 98 ft (30 m) over their full combined length of 87 miles (140 km), they have provided a rich wildlife habitat and stimulated ambitious human development primarily because of the dependability and strength of the water flow. The Wey has a large catchment area of 389 miles2 (1,007 km2) in a relatively well watered region that enjoys an average rainfall of 2.68 ins (681mm), and the many tributaries ensure that the waters stay flowing even at the height of a dry summer. The stretch of the river that historically has had the biggest incidence of erratic water flow is that on the upper reaches of the North Branch between Alton and Farnham. It is in part the flatness of the Wey valley combined with this large catchment area that has made the valley so prone to flooding. Over centuries various schemes were undertaken to reduce their occurrence and their effect, although it wasn’t until the 1930s Improvement Scheme that the issue was effectively addressed. There are a great many additional drainage cuts and structures including sluices and weirs that we see along the waterway today that were created during this flood prevention scheme. The Wey Navigations themselves are not immune to water shortages and do require careful water management practices to maintain water levels. In July 2005, following the driest winter in thirty years, The National Trust and the Environment Agency issued warnings of the likelihood of low water levels through the summer months. This included posting notices at all of the locks requesting that boats navigating the waterway do their utmost to wait and share the locks in order to preserve water. 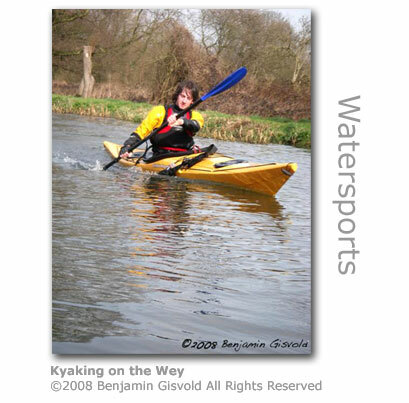 In July 2005 the Guildford Water Festival, an annual boat regatta held on the Wey Navigation, had to be heavily constrained to limit the events to the river between the locks. There was genuine concern that excessive use of the locks would deplete the water levels to such an extent that it would take months to recover. From the rainfall across its catchment area, half is lost by evaporation and vegetation growth, with the balance providing the River Wey on average with 154 million gallons (700 million litres) of water per day, of which 44 million gallons (200 million litres) are withdrawn by abstraction licences issued by the Environment Agency. These licences authorise main users such as local water utility companies, agricultural concerns, golf courses, industrial and mineral processing, and cooling waters for industrial use. Over-extraction can be a problem. The Friends of the Earth cite 364 wildlife sites in the UK that are under threat from over-extraction by water companies and farmers. The River Wey at Alton is one of two rivers the organisation has highlighted as being particularly under threat. There are at least eleven waste treatment plants discharging treated effluent directly into the river, with many more doing so via tributaries including that at Farnham. The effluent from these plants is monitored closely both by the water company and external agencies. The Environment Agency oversees water quality along the Wey and at the beginning of this decade introduced new regulations requiring that wastewater is treated to more stringent quality standards. One positive benefit has been Thames Water’s response at their Haslemere sewage treatment works (GR: SU878325), which in early 2003 had £425,000 worth of improvements applied at the plant, including new screens to filter wastewater more thoroughly. These works discharge into the Wey near Hammer. Sewage works on the Wey include Alton (GR: SU730396), Bentley (GR: SU788437), Passfield (GR: SU819346), Haslemere (GR: SU878325), Elstead (GR: SU912443), Shalford (GR: SU996455), Guildford (GR: TQ001517), Old Woking (GR: TQ027575), Ripley (GR: TQ043572), Wisley (GR: TQ059595) and Weybridge (GR: TQ067633). The welfare of wildlife along the river valley is also a concern at times when the water flow is low. The RSPB is concerned about the welfare of wading birds which along the Wey include the curlew, snipe and lapwing. These birds rely on boggy grassland and damp meadows to nest and feed. Water abstraction during dry periods has a massive impact on the river and raises concerns over improving management. The Environment Agency has taken over from the now defunct National Rivers Authority to regularly monitor the river for pollution. The Agency is a public body for protecting and improving the environment in England and Wales and has 26 local areas working on pollution control of air, land and water and includes flood defence, water resources, conservation, fisheries management, recreation and navigation. 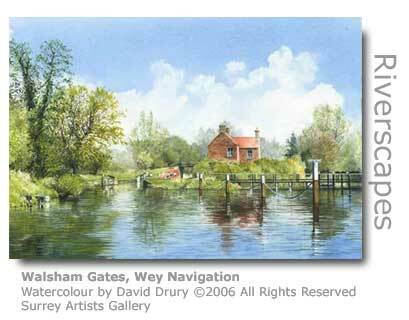 The Agency conducts many practical projects along the Wey. One in 2003 was the construction of a rock and gravel riffle at Peper Harow near Godalming to encourage aquatic invertebrates to colonise and from which fish and other wildlife will benefit. Riffle-building involves raising the river bed by tipping gravel to provide nooks and crannies for the invertebrates, and increases the speed of water flow which they prefer. 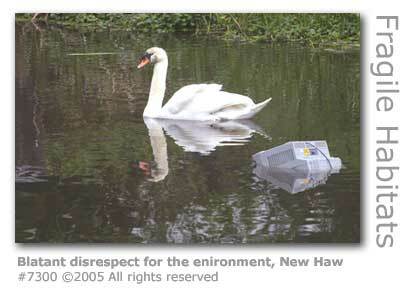 The Environment Agency actively prosecutes polluters of the Wey whether this is direct or indirect. One case in 1999 reported by the BBC involved the decommissioning of an ice cream factory in Alton, Hampshire near the source of the North Branch of the river. The contractors allowed waste ammonia to overflow into a storm drain which discharged into the River Wey polluting a 13 mile stretch of water. 6,000 fish were lost and other wildlife suffered in the incident which cost the contractors £12,000 in fines. The three-mile stretch between Alton and Bentley which was close to the factory resulted in the fish population being “completely devastated”. 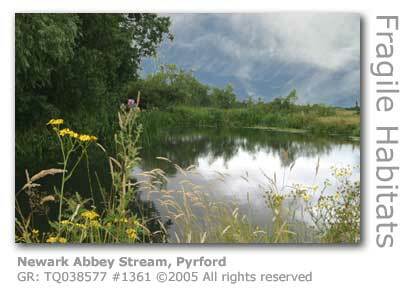 “The River Wey suffered pollution by chlorpyrifos* for two years running. The ACA has been instrumental in setting up a partnership between the water company, the Environment Agency and the fishing club to monitor the river very closely. In 2004, there has been no further pollution and thus the monitoring does seem to be proving successful.” The Anglers’ Conservation Association – Legal Unit 2004. * Chlorpyrifos is an organophosphate pesticide used as insecticides for agricultural use and enters waterways as run-off from fields. Water for Wildlife is a partnership set up to co-ordinate and promote the work of the Wildlife Trusts with water companies and the Environment Agency. Its stated aim is to help protect wetland and river habitats and to reverse the decline of endangered species, one of which is the water vole. The organisation which launched in 2004 has also tasked itself with delivering local Biodiversity Action Plans. One campaign ‘All Choked Up’ targeted organisations that supply aquatic plants to discourage them from stocking non-native plants that are threatening wetland habitats. The campaign also aims to raise public awareness when buying aquatic plants from aquarium, pet and gardening outlets. There are a good number of organisations actively promoting the careful use of British water resources and the protection of both the natural environments and the right of access along these water courses. These regularly run events to provide a practical contribution to maintaining rivers and canals and provide information on the environment, wildlife and how everyone can contribute to their welfare. Visit the websites listed for current events and campaigns. The Wey Fishery Action Plan (FAP) developed with the Wey Valley Fisheries Consultative and local angling clubs, will be underway in late 2005. The main areas of concern are water quality issues on the north branch of the Wey, reduced flows, loss of habitat, the build up of sand shoals and invasive weed. Locally, the FAP is being welcomed as it has given the opportunity for anglers to have a say, improved the working relationship between interested parties and helped to target funding where it is most needed. The major tributary rivers, which deserve exploration in their own right, are the River Slea, Cranleigh Waters; the Tilling Bourne, Stanford (Hoe) Stream, and the River Bourne which meets the Wey just before its confluence with the Thames. The nature of the landscape along the valley is predominantly rural with Alton, Farnham, Godalming, Guildford, Byfleet and Weybridge being the main urban centres. The general geology, soil and topography of the Wey valley has provided, through an alluvium covered with clayey gley soils, a perfect environment for wet meadows lying alongside the river. Further out from the river terrace gravels rise up and blend with gentle sloping valley sides, which with the exception of the larger flatter plains towards the Thames has resulted in spectacularly beautiful and varied countryside. Early industries requiring a good water supply were attracted to the valley and were supported by a versatile and highly productive farming community. This combined wealth of water and fertile land ensured that the Wey became a major centre of milling of all kinds which brought considerable prosperity to the region. The valley so happened also to straddle an important economic and military thoroughfare positioned strategically as it is between London and two historically influential maritime ports, Southampton and Portsmouth. Much of the Wey Valley falls within the Surrey Hills Area of Outstanding National Beauty (AONB), a conservation initiative set up to preserve the natural beauty of the landscape. And so the scene is set where the River Wey for well in excess of a millennium has influenced the course of British and regional history. Not many people are lucky enough to live right alongside the River Wey or its tributaries but those who do have always been regarded as sitting on a goldmine. The Times newspaper undertook detailed research (2006) into waterside properties and discovered that homes overlooking lakes, large ponds, rivers and canals are worth 12% more than similar properties that don't. Much of this has to do with the romantic nature of waterside living that has been nurtured for centuries in the arts, and certainly makes for ease of marketing a property when it goes up for sale. "From an agent's point of view it is a huge merit because it looks so picturesque within the brochures," said Nigel Mitchell of Knight Frank in Guildford. "It's amazing where a photographer will clamber in order to get a shot of a house across water." The inclusion of moorings brings with it the notion of boating along the river on balmy summer evenings and can also realise an additional investment. "The current cost of a private bank mooring is 88p per metre per week plus VAT and will therefore depend upon the length of the craft," said Matthew Burns of agents Burns & Webber. "So for example it will cost about £350 a year to moor a 25ft (7.6m) cruiser." Not all properties automatically have rights for moorings simply because they back on to the river. The owner of the river banks have those rights and even then its not always practical to allow a mooring. "The application for a bank mooring needs to be made to the navigation manager who will make a decision based on a number of factors, such as whether the property is situated on a bend or narrow part of the river, near a weir that affects the water flow rates or near a property with a boat already moored on that section of the river," said Burns. Current concerns over global warming have thrown the threat of flooding firmly into public awareness and some owners and buyers are now debating the pros and cons of owning waterside property in the light of this. "Sadly over the last few years buyers have become more cautious due to the worries of flooding," said Mitchell. "It is now a standard question within the legal enquiries for a client whether a house has been affected or not." Buyers with young families can also be discouraged from living near water for reasons of safeguarding their child's safety. Virtually the whole course of the River Wey and its two navigations run through the western end of the county of Surrey. A study undertaken (March 2007) by the Forestry Commission and Natural England has revealed that the county is better off than most of its neighbours when it comes to access to green space. The main part of the study was based on the Accessible Natural Greenspace Standard (ANGSt) (1) which states the ideal of no person living more than 300 metres (984 ft) from an area of natural green space of at least two hectares (4.94 acres) in area. An additional proviso is that there should be at least one accessible 500 hectare (1,236 acre) site within 10 km (6.2 mi) of their home. Only sites greater than two hectares were included in the study. Guildford and Waverley within the valley provide a 100% score on accessibility to the 500 hectare site. Surrey as a whole, despite being the most populous county has 17% of households meet the full ANGSt requirements, as against 15% in Hampshire and 3% in Kent. The valley in West Surrey has a quarter of the area of outstanding natural beauty (AONB) provided by Surrey Hills as freely accessible natural green space. The South East is England's most wooded region, with 40% of the Surrey Hills classified as woodland. "The average household in Guildford and Waverley has between 10 and 20 green space sites they can visit within 10 kilometres," said Alan Betts, from Forestry Commission South East. 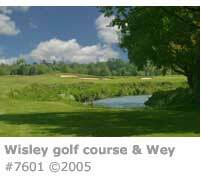 "Compared to most of the South East as a whole, South West Surrey has an exceptional amount of green spaces. Using woodlands for walking or other forms of recreation such as cycling and riding has many benefits. Just being in the presence of trees and woodland can improve stress and wellbeing." The Forestry Commission is intending to use the results of this study to improve access provision and direct government grants to areas in need. (1) The concept of accessible natural greenpsace in urban areas arose from work in the early 1990s that set out to establish the importance of nature in an urban context. English Nature adopted the concept and developed it as a standard in 1995. Various government initiatives have used the ANGSt concept to introduce controls and guidelines on open space access provision. Broadcaster and writer Sandi Toksvig spent a few idyllic hours cruising along the Godalming Navigation aboard the Narrowboat Trincomalee II in the company of owners Euan and Joanna Houston and accompanied by Brian Roberts, the former regional chair of the Inland Waterways Association, together with Steve Haywood a television producer and canal writer. Toksvig's observations and conversations with her guests were broadcast on the 16th August 2008 on the BBC's Radio 4 as a half-hour programme in the Excess Baggage series. The programme can be listened to online HERE. In September 1968 the River Wey burst its banks in many places creating havoc to thousands of homes and businesses all along the valley. Heavy rainfall, which started during the night of Saturday September 14th, persisted for two days and by Monday flood water was six feet (two metres) deep in places. Particularly badly hit was Guildford where buildings within reach of the gushing waters of the Wey were completely swamped. In Millbrook Plummers (now Debenhams), St Nicholas’ Church and the Yvonne Arnaud Theatre were severely damaged. So too were homes along Bedford Road, Walnut Tree Close and at Riverside in Farnham Road. Plummers Department Store ,which had only been opened a year, had its basement completely flooded and with the ground floor under three feet (one metre) of water. The fire brigade had their work cut out pumping five million gallons of water from the building. Many thousands of pounds worth of stock was lost not just at Plummers but also by other retailers in the town. A men’s outfitters in Friary Street without insurance was caught out and had to resort to selling water damaged stock to the public at knock-down prices in order to recoup some of its value. Court Bros, a furnishing store on the corner of Millbrook and the High Street, suffered losses of over £15,000, with the Surrey Advertiser reporting that the manager boated in through a broken window to inspect the damage. The town rallied to help with no shortage of volunteers on hand to rescue people and valuables. Amongst these were the Women’s Royal Army Corps, who were based at the barracks in Stoughton, the Women’s Royal Voluntary Service and the Red Cross, who were joined by local guides and scout troops. At St Nicholas Church, when it was realised that the flood water was going to reach the high altar where the rector had hurriedly stored valuable items, a boat was secured and the valuables, including a 17th Century chalice, were ferried to safety. All along the river the police and army used inflatable boats to rescue people stranded in their homes and ferry them to safety. In Sandfield Terrace Drill Hall alone in Guildford 250 residents were given shelter. Guildford’s mayor launched a fund to help those who had unwittingly become flood victims. It is however perhaps quite surprising that despite the floods of 1968, and subsequent flood warnings along the Wey in more recent times, that little has been done by way of improving flood control along the river. In 2008 Elmbridge Borough Council identified the River Wey, along with the Thames, Mole and Rythe, as the most likely sources of flooding in the borough. Elmbridge, which is responsible for the valley as it nears its confluence with the Thames, has undertaken a flood alleviation scheme along the lower Mole which was completed in the early 1980s. 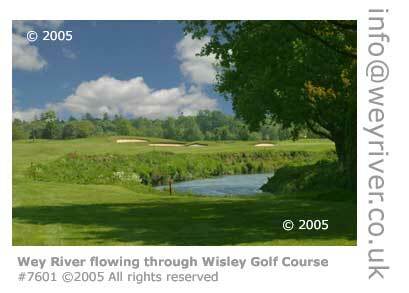 However a scheme proposed around the same time for the Wey has yet to see the light of day. If you live and work along the River Wey you can check the level of risk of flooding for your location at the Environment Agency’s website HERE. If you are in an area of risk the Environment Agency also run an early-warning system which is provided free – call Floodline on 0845 881188. The National Flood School is based in Farnham. The organisation, which was founded in 1988, is primarily concerned with developing, testing and training in techniques and systems for restoring property damaged by flooding. It's main customers for courses are from organisations involved in building restoration, together with insurers and loss adjusters. The organisation has also produced practical guides for property owners who have suffered from the effects of flooding. See here for a YouTube video uploaded by the school (September 2010). Waverley Borough Council (WBC) has taken an active interest in monitoring air quality in the Wey Valley. The authority has established three 'continuous air quality monitoring stations' (AQMA) together with a 'network of passive diffusion tube samplers'. Farnham: junction of East Street and Bear Lane. Godalming: roadside on Ockford Road outside the Christain Science Church. Hindhead: junction of A3 Portsmouth Road and A287 Haslemere to Farnham Road, in the carpark off Heather Way about 100 yards (100m) from the Hindhead crossroads. These stations produce real-time readings of air pollution levels and measure these against the government's 'hourly objective' for specified pollutants. All three stations monitor the air for nitrogen dioxide, and additionally particulates - specifically PM10s (1) - in Farnham. There are 40 locations within Waverley borough where diffusion tubes are sited. These collect air samples in test tube equipment to allow monitoring of polutants, particularly nitrogen dioxide. These were grouped (2010) around Farnham (15 sites); Haslemere (4); Hindhead (2); Witley (1); Godalming (7); Bramley (2); Cranleigh (4); and Dunsfold (2). The authority's Air Quality Progress Report 2010 stated that concentrations of nitrogen dioxide exceeded government targets at a number of locations. Of particular concern was the railway crossing by Farnham station 'which may give a risk of exceedences of an air quality objective'. WBC applied requirements by DEFRA and assigned the location for detailed assessment. The authority also flagged potential air quality issues when the East Street development in Farnham is completed. The scheme allows 239 homes, a multi-screen cinema, shops, cafes and restaurants. Other development sites flagged in the report included the Godalming 'Key Site' (182 homes and commercial space) and the new recycling facilities at Runfold South Quarry. The Air Quality Progress Report 2011 highlights the fact that an additional two diffusion tube sites were added (by railway crossing in Farnham) and that these had 'determined that the concentrations of nitrogen dioxide are close to but not exceeding the annual mean objective at locations of relevant exposure in the vicinity'. It also stated that the 2010 showed 'a general reduction in [PM10] concentrations in comparison to last year', but that nitrogen dioxide 'exceeded the annual mean objective in some but not all locations'. It also indicated that implementation of 'strict traffic and dust emission mitigation measures that must be submitted for approval' before the Farnham East Street development starts. The authority uses Lambeth Scientific Services to provide analysis of the diffusion tubes. The Air Quality Progress Reports can be downloaded as PDFs from WBC's website HERE. 1. Reduce traffic entering the town centre. By reducing the number of vehicles entering the town, traffic emissions can be reduced by the same proportion. Measures can be "sticks" that force people to travel by alternative routes or modes, or "carrots" that persuade people to do so. 2. Manage traffic in the town centre better Emissions are at their highest when vehicles are stationary and the vehicles' engines are idling. By allowing traffic to move more freely, emissions can be reduced as engines are more efficient when travelling. 3. Reducing Farnham's vehicle emissions at source By encouraging low emission vehicles and fuels including electric vehicles, emissions can be reduced. It is recognised that local authorities only have persuasive powers over the majority of vehicles on the road. Vehicles owned or contracted on behalf of Waverley Borough Council and Surrey County Council could be made to be low emission vehicles (where such vehicles exist). The infrastructure for fuelling the vehicles (e.g. electric car re-charging point) could be provided.